"Warner Bros. Fanfare & Main Title" (clip) by Max Steiner from NOW, VOYAGER (1942) (a .MP3 file courtesy RCA Victor). "Madame Bovary" (clip) by Miklos Rozsa from MADAME BOVARY (1949) (a .MP3 file courtesy Rhino Records). "Waltz" (clip) by Miklos Rozsa from MADAME BOVARY (1949) (a .MOV file courtesy Rhino Records). Gladys Cooper by Gladys Cooper (London: Hutchinson, 1931). Without veils; the intimate biography of Gladys Cooper (with an introd. by W. Somerset Maugham) by Sewell Stokes (London: P. Davies, 1953). 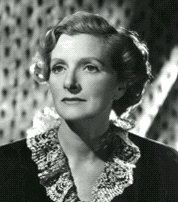 Gladys Cooper : a biography by Sheridan Morley (New York : McGraw-Hill, c1979). Dames of the theatre by Eric Johns (New Rochelle, N.Y. : Arlington House, 1974).